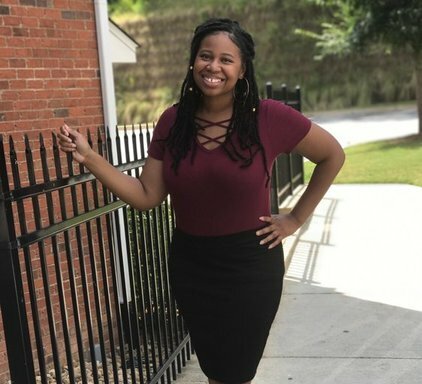 Prior to her internship with Lamar County, Sarinya Lyons had some exposure about how counties operate through the college courses she took as a health science major at Clayton State University, and by working with elections. During her records retention internship, Lyons learned about the inner workings of county government and the specific factors that go into local decision-making including budgets, records, policies, and employee positions. Over the course of her time with the county, Lyons was tasked with creating an accessible and detailed record retention policy for the administrative office. The policy had to be in compliance with state requirements and required her to become familiar with record retention policy guidelines provided by the state. Lyons believed that the most successful task she accomplished during her internship was creating a record retention manual that goes above the listed requirements of the internship. Lyons’ favorite part of the internship experience was working with county staff and completing a project that both contributed to the efficiency of the administrative office and enhanced the community’s access to county records. Lyons also learned about proper record keeping and policy concerning confidential and historical records within an administration department along with the importance of proper research. She believed that this knowledge will be beneficial to her future career in public health since she will have to work and be familiar with these types of records as she works with the community. Lyons encourages her peers to pursue county internships. She advised that they should be open to enhancing their knowledge outside of what is expected directly from the internships and noted that these internships will help contribute to their future career choice through experiences and learned skills. When asked if there was a career in county government for Lyons in the future, she answered yes. Lyons internship with Lamar County was made possible through grant funding provided by the Community Foundation of Central Georgia, Inc.